After the opening acts of Lima, Arequipa and Puno, it was time for Peru’s main gigs: Cusco and Machu Picchu! Cusco was the capital of the Inca Empire before the Spanish ‘conquistadores’, and is today a UNESCO World Heritage site. As we strolled down the impeccably conserved historical districts, we discussed how, after 500 years, two radically different cultures have somehow been seamlessly combined: from the Spanish, you’ll find the language and religion (close to 80% of Peruvians are Catholic); from the Incas, you’ll notice the incredible architecture and the close relationship with nature (as one Peruvian told us, “Church connects us to heaven, ‘Pachamama’ connects us to earth”). However, most of the original Incan monuments were in some way altered: an example is the Church of ‘Santo Domingo’, built on top of the Qurikancha, the impressive Incan Temple of the Sun. Nowadays it is possible to see the Incan structures below the church. This is due to the restoration works after a major earthquake in 1950, that caused damages to the church and exposed the undamaged Incan temple below. That’s one of the reasons why Machu Picchu is so special: hidden behind mountains and ridges, it was never plundered by the ‘conquistadores’ and stands today as one of the most vivid images of how the incredible Incan civilization lived (or at least how some of them lived, as it is seems Machu Picchu was an elite resort of sorts). Unless you’re into jumbo pizzas and bucket margaritas, run away from this tourist trap as soon as possible! We got to Machu Picchu around 7am. It was tempting to stay and enjoy the view, but we still had to climb up the ‘Montaña’! Can you imagine living in such a place? Back to the Machu Picchu park entrance, that’s a wrap! Machu Picchu is less than 100km from Cusco, but there’s two issues in getting there. The first one is that it is obscenely expensive: there’s no road, so foreigners will need to cough up a minimum of 150 US$ to get there by train (locals can do it for 6$). Alternatives to the train include hiking the Inca Trail (incredibly cool but equally expensive and always booked months in advance) or trying out this intriguing back door (we’re always up for sticking it to the man, but unfortunately didn’t have enough time to try this out). The second issue is that you need to spend a night at Aguas Calientes, located in the foothills of Machu Picchu, to ensure that you can visit the site bright and early. Now, unless you’re into rows and rows of restaurants offering jumbo pizzas and bucket margaritas, run away from this boom town as early as possible. The earliest we could muster was leaving our hostal at 5:30am (from our not too well insulated window we started hearing happy campers at 4:30am). 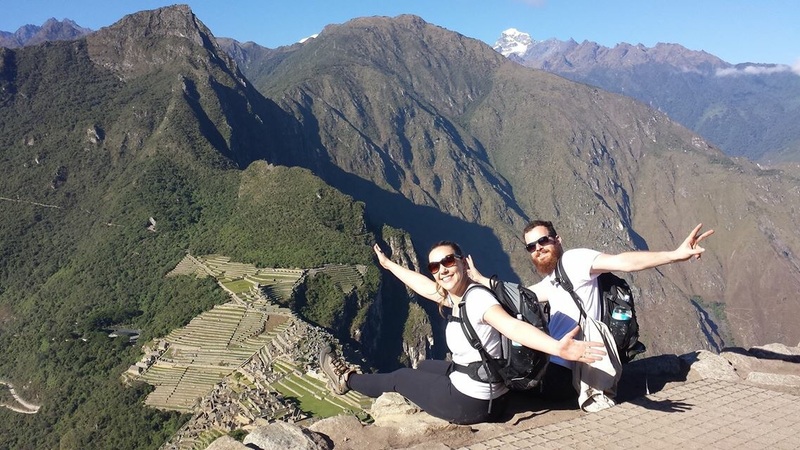 Motivated by our incredible hike up Colca Canyon (and the fact we’re stingy), we decided to hike all the way to Machu Picchu (saving the 18 US$ bus fare) and then continue to climb up the ‘Montaña’. At 3.100 meters (600 meters above Machu Picchu and 1.100 meters above Aguas Calientes), it has one of the most incredible views I’ve ever seen (a tall order, as memorable views are bread and butter in Peru). The hike is challenging, but probably a hair easier than Colca Canyon. Jules, what do you think? Reaching the Huayna is a personal challenge, and being at the top is no less gratifying that the climb itself. Then, descending through the ‘Templo de la Luna’ trail is a voyage back in time: there is Incan energy here, almost like its people were never decimated. It is a beautiful place and it is definitely worth the climb! Wandering through those streets and peeking into the houses and temples leaves us with a feeling of sharing their culture and lifestyle. I totally agree with Andy and João: it’s almost like they are still alive! Just a final comment on “how to get there”: there are different options, and you can for sure go for the easiest one and take a bus ride. But you’ll be missing all, the “emotional build up” from the climb up. So even if you don’t want to climb the ‘Montaña’ or ‘Huayna’, make an effort and climb up to Machu Picchu. I can guarantee that you won’t regret it! Day 26: Quito, the highest capital in the world! I haven’t enough words to say what I feel looking at your pictures!… I’ll be back. I’m going to write a Euromilhões ticket! Ahahah!!! No need for euromilhoes 🙂 I’m not saying that it’s cheap, because it’s not, but it’s a lot less than people usually make of it. We just need to be very rigorous with our budget, and decide where to draw the lines. there are pretty cheap accommodations all along the way, and plenty of supermarkets to buy food :))) I guess the most difficult thing to get is the time off… but so far, it has been indeed the trip of a lifetime! Que bom rever esses sítios – estes já eu visitei! 🙂 – sob a vossa perspectiva. Sabem que há uma explicação “esotérica” para o corte preciso das pedras enormes das construções? Porque não há uma explicação científica. A esotérica é que terá havido ajuda de extraterrestres… Porque não?! Este foi um ponto alto da viagem, não foi? 🙂 Obrigada pela partilha. Beijinhos. Boa sorte, e muitas felicidades. Beijos. É verdade, Machu Picchu foi mágico! Obrigado e beijinhos!